The Great Lakes Center will present “Where There’s a Gill, There’s a Way—Parasitism by Freshwater Mussels,” a seminar by Chris Barnhart, professor of biology at Missouri State University, on Thursday, October 23, from 12:15 p.m. to 1:30 p.m. in Science Building 272. Barnhart studies the reproductive biology, ecology, and toxicology of mollusks, particularly freshwater mussels. 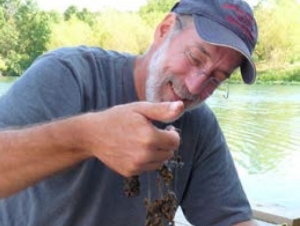 He and his students have developed innovative techniques for the culture of mussels for research and population restoration. He has received the Conservation Champion Appreciation Award of the U.S. Fish and Wildlife Service, and the Lifetime Achievement Award of the Freshwater Mollusk Conservation Society. Native freshwater mussels (Order Unionoida) are an amazing group of bivalves with unusual significance in ecology and conservation. The various North American species, over 300 in all, range in size from microscopic juveniles up to dinner plate-sized "washboard" mussels tipping the scale at several kilos. Some mussel species are abundant enough to shape aquatic ecology, while others are in danger of extinction. Perhaps the most remarkable aspect of mussels is their larval parasitism on fish. Each mussel uses only particular fish species as hosts. This host specificity is a remarkable saga of evolutionary adaptation and diversification. Blind shellfish flaunt incredibly detailed lures, modeling small fish or crayfish to attract the strikes of smallmouth and rock bass. Others extrude red, wormlike aggregates of eggs and larvae to attract the attention of darters, or broadcast webs of nearly invisible threads studded with larvae to ensnare the fins of shad. One genus even grabs fish by the head and then pumps water laden with larvae through the mouth and gills! The intricate relationships between mussel and host are easily disrupted and, thus, contribute to the imperilment of many mussel species, yet they also fascinate us and compel conservation efforts.